An LED lamp or LED light bulb is an electric light for use in light fixtures that produces light using one or more light-emitting diodes (LEDs). LED lamps have a lifespan many times longer than equivalent incandescent lamps, and are significantly more efficient than most fluorescent lamps, with some LED chips able to emit up to 303 lumens per watt (as claimed by Cree and some other LED manufacturers). However, LED lamps require an electronic LED driver circuit when operated from mains power lines, and losses from this circuit mean the efficiency of the lamp is lower than the efficiency of the LED chips it uses. The most efficient commercially available LED lamps have efficiencies of 200 lumens per watt (Lm/W). Commercially available LED chips have efficiencies of over 220 Lm/W. The LED lamp market is projected to grow by more than twelve-fold over the next decade, from $2 billion in the beginning of 2014 to $25 billion in 2023, a compound annual growth rate (CAGR) of 25%. As of 2016[update], LEDs use only about 10% of the energy an incandescent lamp requires. Similar to incandescent lamps (and unlike most fluorescent lamps), LEDs come to full brightness immediately with no warm-up delay. Frequent switching on and off does not reduce life expectancy as with fluorescent lighting. Light output decreases gradually over the lifetime of the LED (see Efficiency droop section). Some LED lamps are made to be a directly compatible drop-in replacement for incandescent or fluorescent lamps. 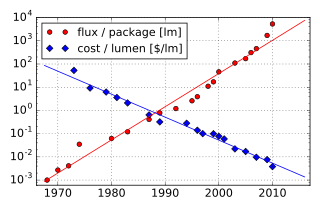 LED lamp packaging may show the light outpur in lumens, the power consumption in watts, the color temperature in Kelvin or a colour description such as "warm white", "cool white" or "daylight", the operating temperature range, and sometimes the equivalent wattage of an incandescent lamp delivering the same output in lumens. The directional emission characteristics of LEDs affect the design of lamps. While a single power LED may produce as much light output as an incandescent lamp using several times as much power, in most general lighting applications multiple LEDs are used. This can form a lamp with improved cost, light distribution, heat dissipation and possibly also color-rendering characteristics. LEDs run on direct current (DC), whereas mains current is alternating current (AC) and usually at much higher voltage than the LED can accept. LED lamps can contain a circuit for converting the mains AC into DC at the correct voltage. These circuits contain rectifiers, capacitors, and may have other active electronic components, which may also permit the lamp to be dimmed. In an LED filament lamp, the driving circuit is simplified because many LED junctions in series have approximately the same operating voltage as the AC supply. Incandescent lights, which produce light with a glowing filament heated by electric current. These are very inefficient, having a luminous efficacy of 10-17 lumens/W, and also have a short lifetime of 1000 hours. They are being phased out of general lighting applications. Incandescent lamps produce a continuous black body spectrum of light similar to sunlight, and so produce high Color rendering index (CRI). Fluorescent lamps, which produce ultraviolet light by a glow discharge between two electrodes in a low pressure tube of mercury vapor, which is converted to visible light by a fluorescent coating on the inside of the tube. These are more efficient than incandescent lights, having a luminous efficacy of around 60 lumens/W, and have a longer lifetime 6,000-15,000 hours, and are widely used for residential and office lighting. However, their mercury content makes them a hazard to the environment, and they have to be disposed of as hazardous waste. Metal-halide lamps, which produce light by an arc between two electrodes in an atmosphere of argon, mercury and other metals, and iodine or bromine. These were the most efficient white electric lights before LEDs, having a luminous efficacy of 75–100 lumens/W and have a relatively long bulb lifetime of 6,000-15,000 hours, but because they require a 5 - 7 minute warmup period before turning on, are not used for residential lighting, but for commercial and industrial wide area lighting, and outdoor security lights and streetlights. Like fluorescents, they also contain hazardous mercury. Considered as electric energy converters, all these existing lamps are inefficient, emitting more of their input energy as waste heat than as visible light. Global electric lighting in 1997 consumed 2016 terawatthours of energy. Lighting consumes roughly 12% of electrical energy produced by industrialized countries. The increasing scarcity of energy resources, and the environmental costs of producing energy, particularly the discovery of global warming due to carbon dioxide emitted by the burning of fossil fuels, which are the largest source of energy for electric power generation, created an increased incentive to develop more energy-efficient electric lights. The first low-powered LEDs were developed in the early 1960s, and only produced light in the low, red frequencies of the spectrum. The first high-brightness blue LED was demonstrated by Shuji Nakamura of Nichia Corporation in 1994. The existence of blue LEDs and high-efficiency LEDs led to the development of the first 'white LED', which employed a phosphor coating to partially convert the emitted blue light to red and green frequencies creating a light that appears white. Isamu Akasaki, Hiroshi Amano and Nakamura were later awarded the 2014 Nobel Prize in Physics for the invention of the blue LED. Philips Lighting ceased research on compact fluorescents in 2008 and began devoting the bulk of its research and development budget to solid-state lighting. On 24 September 2009, Philips Lighting North America became the first to submit lamps in the category to replace the standard 60 W A-19 "Edison screw fixture" light bulb, with a design based on their earlier "AmbientLED" consumer product. On 3 August 2011, DOE awarded the prize in the 60 W replacement category to a Philips LED lamp after 18 months of extensive testing. Also in 2008 in the United States and Canada, the Energy Star program began to label lamps that meet a set of standards for starting time, life expectancy, color, and consistency of performance. The intent of the program is to reduce consumer concerns due to variable quality of products, by providing transparency and standards for the labeling and usability of products available in the market. Energy Star Certified Light Bulbs is a resource for finding and comparing Energy Star qualified lamps. A similar program in the United Kingdom (run by the Energy Saving Trust) was launched to identify lighting products that meet energy conservation and performance guidelines. In January 2009, it was reported that researchers at University of Cambridge had developed an LED lamp that costs £2 (about $3 U.S.), is 12 times as energy efficient as a tungsten lamp, and lasts for 100,000 hours. As of 2016[update], in the opinion of Noah Horowitz of the Natural Resources Defense Council, new standards proposed by the United States Department of Energy would likely mean most light bulbs used in the future would be LED. In 2008 Sentry Equipment Corporation in Oconomowoc, Wisconsin, US, was able to light its new factory interior and exterior almost solely with LEDs. Initial cost was three times that of a traditional mix of incandescent and fluorescent lamps, but the extra cost was recovered within two years via electricity savings, and the lamps should not need replacing for 20 years. In 2009 the Manapakkam, Chennai office of the Indian IT company, iGate, spent ₹3,700,000 (US$80,000) to light 57,000 sq ft (5,300 m2) of office space with LEDs. The firm expected the new lighting to pay for itself within 5 years. In 2009 a new highway (A29) was inaugurated in Aveiro, Portugal; it included the first European public LED-based lighting highway. LED lamps are often made with arrays of surface mount LED modules (SMD modules) that replace incandescent or compact fluorescent lamps, mostly replacing incandescent lamps rated from 5 to 200 watts. A significant difference from other light sources is that the light is more directional, i.e., emitted as a narrower beam. General-purpose lighting requires a basically white light, emulating a black body at a specified temperature, from "warm white" (like an incandescent bulb) at 2700K, to "daylight" at around 6000K. The first LEDs emitted light in a very narrow band of wavelengths, of a color characteristic of the energy band gap of the semiconductor material used to make the LED. LEDs that emit white light are made using two principal methods: either mixing light from multiple LEDs of various colors, or using a phosphor to convert some of the light to other colors. The light is not the same as a true black body, giving a different appearance to colors than an incandescent bulb. Color rendering quality is specified by the CRI, and as of 2019[update] is about 80 for many LED bulbs, and over 95 for more expensive high-CRI LED lighting (100 is the ideal value). RGB or trichromatic white LEDs use multiple LED chips emitting red, green, and blue wavelengths. These three colors combine to produce white light. The color rendering index (CRI) is poor, typically 25 - 65, due to the narrow range of wavelengths emitted. Higher CRI values can be obtained using more than three LED colors to cover a greater range of wavelengths. The second basic method uses LEDs in conjunction with a phosphor to produce complementary colors from a single LED. Some of the light from the LED is absorbed by the molecules of the phosphor, causing them to fluoresce, emitting light of another color via the Stokes shift. The most common method is to combine a blue LED with a yellow phosphor, producing a narrow range of blue wavelengths and a broad band of "yellow" wavelengths actually covering the spectrum from green to red. The CRI value can range from less than 70 to over 90, although a wide range of commercial LEDs of this type have a color rendering index around 82. Following successive increases in efficacy, which has reached 150 lm/W on a production basis as of 2017, this type has surpassed the performance of trichromatic LEDs. The phosphors used in white light LEDs can give correlated color temperatures in the range of 2,200 K (dimmed incandescent) up to 7,000 K or more. Tunable lighting systems employ banks of colored LEDs that can be individually controlled, either using separate banks of each color, or multi-chip LEDs with the colors combined and controlled at the chip level. For example, white LEDs of different color temperatures can be combined to construct an LED bulb that decreases its color temperature when dimmed. LED chips require controlled direct current (DC) electrical power and an appropriate circuit as an LED driver is required to convert the alternating current from the power supply to the regulated voltage direct current used by the LEDs. LED drivers are the essential components of LED lamps or luminaries. A good LED driver can guarantee a long life for an LED system and provide additional features such as dimming and control. The LED drivers can be put inside the lamp or luminaire, which is called a built-in type (or integral), or be put outside, which is called an independent type (or remote). According to different applications, different types of LED drivers need to be applied; for example, an outdoor driver for street light, an indoor point driver for a down light, and an indoor linear driver for a panel light. Compared to other lighting systems LEDs must be kept cool as high temperatures can cause premature failure and reduced light output. Thermal management of high-power LEDs is required to keep the junction temperature close to ambient temperature. LED lamps typically include heat dissipation elements such as heat sinks and cooling fins and very high power lamps for industrial uses are frequently equipped with cooling fans. In addition to being less efficient, operating LEDs at higher electric currents produces high temperatures which compromise the lifetime of the LED. Because of this increased heating at higher currents, high-brightness LEDs have an industry standard of operating at only 350 mA, giving a good compromise between light output, efficiency, and longevity. Early suspicions were that the LED droop was caused by elevated temperatures. Scientists proved the opposite to be true—that, although the life of the LED would be shortened, elevated temperatures actually improved the efficiency of the LED. The mechanism causing efficiency droop was identified in 2007 as Auger recombination, which was taken with mixed reaction. A 2013 study conclusively identified Auger recombination as the cause of efficiency droop. LED lamps are used for both general and special-purpose lighting. Where colored light is needed, LEDs that inherently emit light of a single color require no energy-absorbing filters. Computer-led LED lighting allows enhancement of unique qualities of paintings in the National Museum in Warsaw. LED lamps are made with standard lamp connections and shapes, such as an Edison screw base, an MR16 shape with a bi-pin base, or a GU5.3 (bi-pin cap) or GU10 (bayonet fitting) and are made compatible with the voltage supplied to the sockets. They include driver circuitry to rectify the AC power and convert the voltage to an appropriate value, usually a switched-mode power supply. Some models of LED lamps are compatible with dimmers as used for incandescent lamps (although dimmers for incandescent lighting are not suitable for LEDs). LED lamps often have directional light characteristics. These lamps are more power-efficient than compact fluorescent lamps[better source needed] and offer lifespans of 30,000 or more hours, reduced if operated at a higher temperature than specified. Incandescent lamps have a typical life of 1,000 hours, and compact fluorescents about 8,000 hours. The lamps maintain output light intensity well over their lifetimes. Energy Star specifications require the lamps to typically drop less than 10% after 6,000 or more hours of operation, and in the worst case not more than 15%. LED lamps are available with a variety of color properties. The purchase price is higher than most other lamps—although dropping—but the higher efficiency may usually makes total cost of ownership (purchase price plus cost of electricity and changing bulbs) lower. As of 2016[update], in the United States, LED lamps are close to being adopted as the mainstream light source because of the falling prices and because incandescent lamps are being phased out. In the U.S. the Energy Independence and Security Act of 2007 effectively bans the manufacturing and importing of most current incandescent lamps. LED lamps have decreased substantially in price, and many varieties are sold with subsidized prices from local utilities. LED tube lights are designed to physically fit in fixtures intended for fluorescent tubes. Some LED tubular lamps are intended to be a drop-in replacement into existing fixtures if appropriate ballast is used. Others require rewiring of the fixtures to remove the ballast. An LED tube lamp generally uses many individual Surface-Mounted LEDs which are directional and require proper orientation during installation as opposed to Fluorescent tube lamps which emit light in all directions around the tube. Most LED tube lights available can be used in place of T5, T8, T10, or T12 tube designations, T8 is D26mm, T10 is D30mm, in lengths of 590 mm (23 in), 1,200 mm (47 in) and 1,500 mm (59 in). Newer light fittings with long-lived LEDs built-in, or designed for LED lamps, have been coming into use as the need for compatibility with existing fittings diminishes. Such lighting does not require each bulb to contain circuitry to operate from mains voltage. Experiments revealed surprising performance and production of vegetables and ornamental plants under LED light sources. Many plant species have been assessed in greenhouse trials to make sure that the quality of biomass and biochemical ingredients of such plants is at least comparable with those grown in field conditions. Plant performance of mint, basil, lentil, lettuce, cabbage, parsley and carrot was measured by assessing both the health and vigor of the plants and the success of the LEDs in promoting growth. Also noticed was profuse flowering of select ornamentals including primula, marigold and stock. Light emitting diodes (LEDs) offer efficient electric lighting in desired wavelengths (red + blue) which support greenhouse production in minimum time and with high quality and quantity. As LEDs are cool, plants can be placed very close to light sources without overheating or scorching, requiring much less space for intense cultivation than with hot-running lighting. White LED lamps have achieved market dominance in applications where high efficiency is important at low power levels. Some of these applications include flashlights, solar-powered garden or walkway lights, and bicycle lights. Colored LED lamps are now commercially used for traffic signal lamps, where the ability to emit bright light of the required color is essential, and in strings of holiday lights. LED automotive lamps are widely used for their long life and small size. Multiple LEDs are used in applications where more light output than available from a single LED is required. By about 2010 LED technology came to dominate the outdoor lighting industry; earlier LEDs were not bright enough for outdoor lighting. A study completed in 2014 concluded that color temperature and accuracy of LED lights was easily recognized by consumers, with preference towards LEDs at natural color temperatures. LEDs are now able to match the brightness and warmer color temperature that consumers desire from their outdoor lighting system. LEDs are increasingly used for street lighting in place of mercury and sodium lamps due to their lower running and lamp replacement costs. However, there have been concerns that the use of LED street lighting with predominantly blue light can cause eye damage, and that some LEDs switch on and off at twice mains frequency, causing malaise in some people, and possibly being misleading with rotating machinery due to stroboscopic effects. These concerns can be addressed by use of appropriate lighting, rather than simple concern with cost. The light from white LED lamps is usually provided by industry standard LED surface-mounted devices (SMD's). Non-SMD types of LED lighting also exist, such COB (chip on board) and MCOB (multi-COB). SMD LED Modules are described by the dimensions of the LED package. A single multicolor module may have 3 individual LEDs within that package, one each of red, green and blue, to allow many colors or shades of white to be selected, by varying the brightness of the individual LEDs. LED brightness may be increased by using a higher driving current, at the cost of reducing the device's lifespan. Comparison of SMD LED modules used on an LED strip light. Halogen lamps (also known as "quartz-halogen") are just incandescent lamps that run at a higher temperature than standard incandescents. They are slightly more efficient. High-pressure sodium lamps give around 100 lumens/watt which is very similar to LED lamps. They have much shorter life than LEDs, and their color rendering index is low. They are commonly used for outdoor lighting and in grow lamps. In keeping with the long life claimed for LED lamps, long warranties are offered. However, currently there are no standardized testing procedures set by the Department of Energy in the United States to prove these assertions by each manufacturer. A typical domestic LED lamp is stated to have an "average life" of 15,000 hours (15 years at 3 hours/day), and to support 50,000 switch cycles. Incandescent and halogen lamps naturally have a power factor of 1, but Compact fluorescent and LED lamps use input rectifiers and this causes lower power factors. Low power factors can result in surcharges for commercial energy users; CFL and LED lamps are available with driver circuits to provide any desired power factor, or site-wide power factor correction can be performed. EU standards requires a power factor better than 0.5 for lamp powers up to 25 watts and above 0.9 for higher power lamps. Is durable – won't break like a bulb. Many will not work with existing dimmer switches designed for higher power incandescent lamps. LED life span drops at higher temperatures, which limits the power that can be used in lamps that physically replace existing filament and compact fluorescent types. Thermal management of high-power LEDs is a significant factor in design of solid state lighting equipment. LED lamps are sensitive to excessive heat, like most solid state electronic components. LED lamps should be checked for compatibility for use in totally or partially enclosed fixtures before installation as heat build-up could cause lamp failure and/or fire. The human circadian rhythm can be affected by light sources. The effective color temperature of daylight is ~5,700K (bluish white) while tungsten lamps are ~2,700K (yellow). People who have circadian rhythm sleep disorders are sometimes treated with light therapy (exposure to intense bluish white light during the day) and dark therapy (wearing amber-tinted goggles at night to reduce bluish light). Research suggests that the shift to LED street lighting attracts 48% more flying insects than HPS lamps, which could cause direct ecological impacts as well as indirect impacts such as attracting more gypsy moths to port areas. ^ "How Energy-Efficient Light Bulbs Compare with Traditional Incandescents". energy.gov. Retrieved 4 February 2018. ^ "CFLs vs. LEDs: The Better Bulbs". greenamerica.org. Retrieved 31 August 2016. ^ "Lightbulb Efficiency Comparison Chart". greatercea.org. Retrieved 4 February 2018. ^ "LEDs Will Get Even More Efficient: Cree Passes 300 Lumens Per Watt". forbes.com. Retrieved 31 August 2016. ^ Damir, B (2012). "Longevity of light bulbs and how to make them last longer". RobAid. Archived from the original on 19 August 2015. Retrieved 10 August 2015. ^ 2006 Millennium technology prize awarded to UCSB's Shuji Nakamura. Ia.ucsb.edu (15 June 2006). Last retrieved on 22 June 2016. ^ "The Nobel Prize in Physics 2014 – Press release". www.nobelprize.org. Retrieved 7 October 2014. ^ "L-Prize - Bright Tomorrow Lighting Prizes". ^ a b c "Fans of L.E.D. 's Say This Bulb's Time Has Come". The New York Times. 28 July 2008. ^ a b Taub, Eric; leora Broydo Vestel (24 September 2009). "Build a Better Bulb for a $10 Million Prize". New York Times. Retrieved 4 February 2018. ^ Department of Energy Announces Philips Lighting North America as Winner of L Prize Competition |Department of Energy. Energy.gov (3 August 2011). Retrieved 2018-02-04. ^ American National Standard for Specifications for the Chromaticity of Solid-State Lighting (SSL) Products Archived 8 July 2008 at the Wayback Machine. Nema.org. Retrieved 2 June 2012. ^ Energy Star Program Requirements for CFLS Partner Commitments, 4th edition, dated 03/07/08, retrieved 25 June 2008. ^ Energy saving lighting. Energysavingtrust.org.uk. Retrieved 18 January 2013. ^ Wolverton, Troy (12 March 2016). "Be prepared to say goodbye to the lightbulbs you've loved". The Charlotte Observer. The Mercury News. p. 1C. ^ "Of the top six in Turku, led a move – HS.fi – Domestic". 19 November 2009. Retrieved 9 January 2012. ^ a b Narendran, Nadarajah; Deng, Lei (2002). "Color rendering properties of LED light sources". Proceedings of the SPIE. Solid State Lighting II. 4776: 61. Bibcode:2002SPIE.4776...61N. doi:10.1117/12.452574. ^ "Warm white LED light". Retrieved 4 February 2018. ^ "Two-minute explainer: Tunable-white LEDs". Retrieved 4 September 2016. ^ Ed Rodriguez (17 October 2013). "Cooling high-power LEDs: The four myths about active vs. passive methods". EDN Network. Retrieved 19 January 2019. ^ The LED's dark secret. EnergyDaily. Retrieved on 16 March 2012. ^ Efremov, A. A.; Bochkareva, N. I.; Gorbunov, R. I.; Lavrinovich, D. A.; Rebane, Y. T.; Tarkhin, D. V.; Shreter, Y. G. (2006). "Effect of the joule heating on the quantum efficiency and choice of thermal conditions for high-power blue InGaN/GaN LEDs". Semiconductors. 40 (5): 605. Bibcode:2006Semic..40..605E. doi:10.1134/S1063782606050162. ^ Iveland, Justin; et al. (23 April 2013). "Cause of LED Efficiency Droop Finally Revealed". Physical Review Letters, 2013. Science Daily. ^ "Warsaw Top 10" (PDF). Warsaw tour Edition nr 5, 2012. p. 20. Retrieved 1 March 2013. The National Museum in Warsaw is also one of the most modern in Europe. (...) The LED system allows to adjust the light to every painting so that its unique qualities are enhanced. ^ Moreno, Ivan; Avendaño-Alejo, Maximino; Tzonchev, Rumen I. (2006). "Designing light-emitting diode arrays for uniform near-field irradiance" (PDF). Applied Optics. 45 (10): 2265–2272. Bibcode:2006ApOpt..45.2265M. doi:10.1364/AO.45.002265. PMID 16607994. ^ Moreno, Ivan; Contreras, Ulises (2007). "Color distribution from multicolor LED arrays". Optics Express. 15 (6): 3607–18. Bibcode:2007OExpr..15.3607M. doi:10.1364/OE.15.003607. PMID 19532605. ^ Lonsdale, Sarah (7 July 2010). "Green property: energy-efficient bulbs". The Daily Telegraph. London. Retrieved 8 June 2011. ^ Taub, Eric (11 February 2009). "How Long Did You Say That Bulb Would Last". New York Times. Retrieved 9 March 2016. ^ "Q&A: How much can I save by replacing incandescent bulbs with CFLs?". Consumer Reports. 29 March 2010. Retrieved 4 February 2018. ^ "Integral LED Lamps Criteria Development" (PDF). ^ "Highways Magazine - Public Health England issues LED street lighting warning". Highways Magazine (UK). 3 April 2008. Retrieved 19 January 2019. ^ "What is the difference between 3528 LEDs and 5050 LEDs - SMD 5050 SMD 3528". www.flexfireleds.com. Retrieved 9 November 2015. ^ Wells, Quentin (2012). Smart Grid Home. Cengage Learning. pp. 163–. ISBN 1-111-31851-4. ^ a b Raatma, Lucia (2010). Green Living: No Action Too Small. Compass Point Books. p. 22. ISBN 978-0756542931. ^ "Guide to Selecting Frequently Switched T8 Fluorescent Lamp-Ballast Systems" (PDF). RPI National Lighting Product Information Program. April 1998. Retrieved 23 March 2018. ^ "Table 5.6.A. Average Retail Price of Electricity to Ultimate Customers by End-Use Sector (Oct 2013)". .S. Energy Information Administration. Retrieved 30 December 2013. ^ "LED Candle Lamp is capable of replacing up to a 40-watt incandescent bulb". LEDfy. Retrieved 4 August 2017. ^ "EcoSmart 60-Watt Equivalent Eco-Incandescent A19 Household Light Bulb (4-Pack)". Home Depot. Retrieved 9 October 2017. ^ "Solar LEG Lights - Green Energy". Retrieved 20 January 2014. ^ "60-Watt Equivalent A15 Dimmable Filament Classic Glass LED Light Bulb, Soft White (3-Pack)". Home Depot. Retrieved 4 February 2018. ^ "60W Equivalent Soft White A19 LED Light Bulb (2-Pack)". Home Depot. Retrieved 4 August 2017. ^ "Cree 60W Equivalent Soft White (2700K) A19 Dimmable LED Light Bulb (4-Pack)". Home Depot. Retrieved 9 October 2017. ^ "LED Bulbs: LED Bulb - 9W E27 A60 Thermoplastic Warm White". www.v-tac.eu. Retrieved 4 February 2018. ^ "Lightbulbs – LEDs and CFLs offer more choices and savings" (PDF). ConsumerReports. 2011. Archived from the original (PDF) on 11 August 2013. Retrieved 21 January 2014. ^ "The Clinton Presidency: Protecting Our Environment and Public Health". The White House. Retrieved 4 February 2018. ^ "History of Energy Star". Archived from the original on 27 March 2012. Retrieved 27 March 2012. ^ Alena Tugend (10 May 2008). "If Your Appliances Are Avocado, They're Probably not Green". New York Times. Retrieved 29 June 2008. ^ "Energy star products specs". Retrieved 4 September 2016. ^ ENERGY STAR Program Requirements for Solid State Lighting Luminaires. (PDF). Retrieved 2 June 2012. ^ "Characterizing and Minimizing LED Flicker in Lighting Applications" Steven Keeping (2012). Retrieved on 2 February 2018. ^ "A Review of the Literature on Light Flicker: Ergonomics, Biological Attributes, Potential Health Effects, and Methods in Which Some LED Lighting May Introduce Flicker," IEEE Standard P1789, February 2010. ^ Open letter from Alex Baker, Lighting Program Manager, ENERGY STAR, dated March 22, 2010. ^ West, Kathleen E.; Jablonski, Michael R.; Warfield, Benjamin; Cecil, Kate S.; James, Mary; Ayers, Melissa A.; Maida, James; Bowen, Charles; Sliney, David H.; Rollag, Mark D.; Hanifin, John P.; Brainard, George C. (1 March 2011). "Blue light from light-emitting diodes elicits a dose-dependent suppression of melatonin in humans". J. Appl. Physiol. 110 (3): 619–626. doi:10.1152/japplphysiol.01413.2009. PMID 21164152. ^ Cajochen, Christian; Frey, Sylvia; Anders, Doreen; Späti, Jakub; Bues, Matthias; Pross, Achim; Mager, Ralph; Wirz-Justice, Anna; Stefani, Oliver (1 May 2011). "Evening exposure to a light-emitting diodes (LED)-backlit computer screen affects circadian physiology and cognitive performance". J. Appl. Physiol. 110 (5): 1432–1438. doi:10.1152/japplphysiol.00165.2011. PMID 21415172. ^ Williams, D. R. (2004). "Sun Fact Sheet". NASA. Retrieved 4 February 2018. ^ "Olympus Microscopy Resource Center - Photomicrography - Color Temperature". ^ "Circadian Rhythms Fact Sheet - National Institute of General Medical Sciences". ^ Fahey, Christopher D.; Zee, Phyllis C. (1 December 2006). "Circadian rhythm sleep disorders and phototherapy". Psychiatr. Clin. North Am. 29 (4): 989–1007, abstract ix. doi:10.1016/j.psc.2006.09.009. PMID 17118278. ^ Appleman, Kenneth; Figueiro, Mariana G.; Rea, Mark S. (1 May 2013). "Controlling light–dark exposure patterns, rather than sleep schedules, determines circadian phase". Sleep Med. 14 (5): 456–461. doi:10.1016/j.sleep.2012.12.011. PMC 4304650. PMID 23481485. ^ "AMA Adopts Community Guidance to Reduce the Harmful Human and Environmental Effects of High Intensity Street Lighting". www.ama-assn.org. Retrieved 4 February 2018. ^ Pawson, S.; Bader, M. (October 2014). "LED lighting increases the ecological impact of light pollution irrespective of color temperature". Ecological Applications. 24 (7): 1561–1568. doi:10.1890/14-0468.1. Retrieved 6 January 2017. Krigel, A; Berdugo, M; Picard, E; Levy-Boukris, R; Jaadane, I; Jonet, L; Dernigoghossian, M; Andrieu-Soler, C; Torriglia, A; Behar-Cohen, F (2016). "Light-induced retinal damage using different light sources, protocols and rat strains reveals LED phototoxicity" (PDF). Neuroscience. 339: 296–307. doi:10.1016/j.neuroscience.2016.10.015. PMID 27751961.